Two VHS students were recently selected as dual winners of the Don Johnson Young Writer's Award. 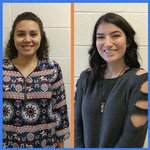 Two VHS students were recently selected as dual winners of the Don Johnson Young Writer's Award. Students from across the region submitted poetry to the annual poetry competition hosted by ETSU's Sigma Tau Delta. This year, committee members selected Neisha French's poem "We Still Asked Him to Crawl" and Tiannah Sanders' "Icarus" as winners. French and Sanders will receive checks for $100 each and a singed copy of Dr. Johnson newest edition "More Than Heavy Rain." that the world would change. made jokes of his name. and brought sorrow to my eyes. so they asked for more of him. that he is but a natural thing. We still asked him to crawl! to touch the sky, go higher. his lesson had been learned. just the wings, Icarus, and the sea. NJROTC Places in National Air Rifle Championships Boys Basketball Enjoying Life at the Top VHS NJROTC - A Tradition of Excellence NJROTC Earns Second Place at Competition NJROTC Goes to Washington New Track Records! VHS Receives Safe Sports School Award Women's Choir Advances to State NJROTC Scores Big VHS Cosmetology Places at SkillsUSA VHS Wrestling Competes at State VHS Swimming Competes at State Dual Winners Selected for Poetry Award Students Place in Eastman Oratorical Contest Tennessee Wesleyan Signs Two Falcons! 100% of the faculty/staff at Volunteer High School are Highly Qualified as defined by NCLB.